Today I will address the question, why we have to engage with the People’s Republic of China (PRC). A simple answer is because China is of overwhelming importance to Australia. But that obscures the complexities of this great but controversial nation. We must untangle these often contentious issues to explain frankly why – regardless of our likes and dislikes – we simply must do our best to maintain a constructive relationship with the PRC. Let us be clear first about how values and national interests determine our foreign policy. Our values – including our commitment to a free and open society, to the rule of law, and to the universality of human rights – are a constant. We do not negotiate or compromise our values. Interests dictate how we manage our foreign relations. For any relationship to work, interests have to be negotiated. We will strive for a fusion of security and economic interests, but we must recognise that at times we will prioritise one over the other. We want to live in a clean and sustainable environment. We want a mutually agreed upon set of rules about how nations interact in the Indo-Pacific region and the world. We want to be at peace. We want to have control over our own affairs, without undue influence from other countries. In short, we must be masters of our own house. Each of these interests is impacted by the People’s Republic of China. Whatever we think of some actions of the government in Beijing, we must acknowledge that, while we are complementary economies, Australia and the PRC are very different societies, with different political and legal systems, different interests, and different values and world views. We want to continue to live in a prosperous society and enjoy the lifestyle we have. Our prosperity depends heavily on the PRC. China is the world’s largest or second-largest economy, depending on how you measure it. It is an irreplaceable part of the global and regional economy. China is the largest or second-largest trading partner for all countries in North and Southeast Asia. Fortunately, the economies of Australia and the PRC are complementary. We have high-quality resources and services the PRC and its increasingly middle-class citizens seek. The middle class in China will soon consist of over 300 million households, needing raw materials for industry and wanting advanced health care and education as well as reliable sources for food products. The PRC economy is already so large that even if its growth slows considerably – and that could happen – the purchasing and spending power of PRC companies as well as middle-class and wealthy citizens will remain formidable. Today less than 10 per cent of China’s population has a passport. Yet, already one-quarter of total visitor expenditure in Australia comes from PRC tourists. Think of the day – not far off – when 20 per cent of PRC citizens have a passport and the possibility to visit Australia. Today our universities rely financially on tuition fees from international students. One-third – approximately 170,000 – of these overseas students are from the PRC. PRC international students added $11 billion to our economy in 2018. That’s almost as much as our total trade with the United Kingdom. This funding is instrumental for our universities to build laboratories, hire experts, and maintain their ratings as first-class research institutions so they can develop the medical treatments, technologies and energy solutions of tomorrow. Engagement with China’s universities is also essential if we wish to tap into a growing hub of innovation. Australia’s continued prosperity depends, first, on being open to trade and investment. We don’t get rich selling things to ourselves. We thrive in a world of free trade and open markets. We cannot dictate where demand for our goods comes from – be it for our iron ore, coal, beef, or berries – nor who chooses our country as a holiday destination or place of study. Some Australians, wary of the PRC’s growing influence, call for Australia to diversify its external markets. That is understandable. Dependency on one buyer is unhealthy, not only for a company but for a country. The degree of our exposure to the PRC is far from ideal. We must work even harder to make our goods and services desirable to people in countries such as Indonesia, India, Japan and South Korea. However, at the end of the day, the market determines where goods are purchased; where young people pursue a university degree; where a family goes on holiday. That decision is in our hands only to the extent that we can keep Australia competitive. So if we wish to continue to prosper we must accept the facts: Projections of demand from the PRC are mindboggling. For example, beef consumption in the PRC is expected to rise 47 per cent by 2030. Australia has always relied on foreign investment. Our savings are not sufficient to fund our investment needs. The inflow of capital brings competition that drives innovation and, in turn, productivity, jobs and growth. For instance, Australian agriculture needs an estimated 300 billion dollars of investment over the next ten years to remain competitive. That sum simply cannot be raised domestically. And when we look abroad, Asian money, often PRC money, is a growing source. Naturally we must ensure that investment from the PRC does not pose a national security risk, particularly for our critical infrastructure. We need to continuously review and update screening processes of our Foreign Investment Review Board. Second, and imperative for our desire to continue to enjoy our way of life, is that the PRC is transforming our region in ways we have only just started to understand. With prosperity comes influence. China will have a larger role in setting standards; not only industrial standards, which our businesses will rely on to ensure they remain competitive outside Australia’s borders; but also many other kinds of standards – especially in emerging technologies, new energy sources, Artificial Intelligence, and robotics, for example, and in design and architecture. Australia will be at the table to negotiate these standards to advance our interests. Collaboration between industry and research institutions, both in Australia and in China, is essential for Australian companies and universities to remain globally competitive. At the same time, we must introduce new mechanisms and methods to evaluate joint research projects and investment from the PRC to ensure that collaboration serves Australian interests. Business and the security agencies also need to cooperate more effectively to counter industrial espionage and protect our telecommunication networks. China will have an impact on the future occupations of young Australians – from communication to resources, from education to science. To cut ourselves off from the PRC would be to cut ourselves off from the world. The entrepreneurial buzz in the PRC is palpable even to a short- term visitor. This is not a country that we can or should keep at arm’s length. Our desire to live in a clean, sustainable environment aligns with the PRC’s efforts to reduce greenhouse gas emissions. The government in Beijing has shown a serious commitment to mitigate climate change: it invests heavily in renewable energy; demands that local officials’ performance reviews includes an evaluation of their work to clean up the environment; and imposes restrictions on traffic, coal use and industrial activity to meet the ambitious targets it has set. There are enormous collaboration opportunities for Australia and the PRC to work towards a cleaner planet. Next, to our aim to have a mutually agreed upon set of rules for the region. We need a constructive relationship with the People’s Republic of China because this country will be a dominant force in our region. Not only do we want to be part of research and design teams leading tomorrow’s technological innovations; it is in Australia’s interest to be part of the conversations about the political and economicchanges which a more powerful China will inevitably bring about, especially with regard to how our region operates and is governed. We do not want to be marginalised. We want our voice to be heard. We want to participate in consultations that determine the direction and fate of our region. For that to happen we must understand the policies and goals of the People’s Republic of China and we must work with China and other countries in the region. The rules and institutions which have been central to Australia’s interests for many decades are being eroded from all directions; by the United States, by China and by other states. As a trading nation with global interests, but without the power to impose our will, we care about international rules. Together with others in the region we must engage the PRC, on the basis of give and take, to find mutually acceptable rules for all. Together we need to convince Beijing that some of its heavy-handed actions are ultimately counterproductive. And that the best way for the PRC to be respected as a great power is to adhere to mutually accepted rules. Deep and forward-looking engagement with the PRC means putting serious effort into making the PRC international student experience in Australia meaningful. It entails expanding collaboration with the PRC on projects in the Pacific Islands, especially to combat climate change, which Pacific states are seriously concerned about. It means deepening security cooperation and undertaking concrete action on issues such as crisis management, conflict resolution, nuclear safeguards, anti-piracy, counter-terrorism, and disaster relief. Australians need to know the world more than they ever thought necessary in the past. We need to become more China-literate. What precisely do I mean? Many more Australians need to master the Chinese language and many, many more Australians need to learn about the PRC, and the mindset within the Communist Party of China. As a government wanting to influence both PRC thinking and the way in which our relationship with the PRC develops, we must devote much more time to the China relationship than we have done. Ministers, politicians generally, and public servants must visit the PRC often; continuously pursue face-to-face engagement to investigate and understand PRC objectives and policies; and seek to identify matters in which our interests align with the PRC’s. And now to the most profound of all our interests, we want to be at peace. How does this relate to the People’s Republic of China? First, we must ask, what kind of a country can we expect the PRC to become? President Xi Jinping has urged his people to aspire to a China Dream. He wants to make China modern and successful. He wants the People’s Liberation Army to be strong. He wants the People’s Republic to be a technological superpower. He wants to strengthen the ideological legitimacy of the Communist Party. He strives to achieve all that by continuously raising the living standards of PRC citizens and enhancing the PRC’s international standing. His words resonate with many PRC citizens, indeed with many people of Chinese heritage across the globe. The China Dream reflects a historical yearning for wealth, power, respect, and the global standing it commanded before it experienced a century of shame and humiliation at the hands of colonial powers. We must not forget the energy and determination with which hundreds of millions of Chinese have gone about fulfilling their personal dreams over the past four decades. At the same time we must not forget the 3 billion Asians outside the People’s Republic who also are pursuing their dreams and who, like Australians, must find a way to forge a meaningful relationship with the PRC for many of the same reasons as we do. A plausible goal set by the Communist Party of China stipulates that the country (or most of it) will become prosperous by 2049. This means Australia must assume the PRC will be even more powerful and have at its disposal the means to be even more assertive than it is today. The Beijing government’s assertiveness is already a challenge for us and for other countries. The unilateral actions which the PRC takes to dispute maritime boundaries are confronting. It has also been willing to pressure countries economically and use other forms of coercion. It has stepped up its pressure on Hong Kong and Taiwan. The manner in which Australia and its neighbours object to this assertiveness will determine the kind of region we live in. Australia will speak out when the PRC’s actions are objectionable and contrary to our values. Indeed, we will call out any country whose actions we find unacceptable. Together with like-minded Asian countries Australia must find new mechanisms and responses to unacceptable actions by China or any other nation. We will seek to draw China into a discussion of mutually acceptable rules of behaviour. We must also speak up when we do not accept violations against what are internationally accepted as universal human rights. We must be mindful to ensure that our public discussion is based on facts, and is not overblown or emotive. A sober, matter-of-fact approach will help us convey our message to the PRC. President Xi Jinping has said that China needs to learn to tell its story better, and there is much good to tell. But not all good. The Uighur story, for example, is not a good one. Reports of the mass detention of Uighurs in Xinjiang deeply concerns us. The government is committed to a meaningful relationship with the PRC. We will rely on all the tools in the box of statecraft and diplomacy to navigate this unpredictable era, avoiding the perils of fatalism, or fixation on narrow, one-dimensional assessments of China. We will not succumb to the temptation of simply focussing on the risks related to the PRC – and we will question those who do, as indeed we question those who do not see those risks. We will cultivate China expertise in all areas of the public service to ensure a well-informed and sophisticated China policy. We will strongly encourage contestability in public service thinking as the best guarantee of good policy advice and effective, agile diplomacy. And we will never accept that issues are viewed exclusively through a security prism. The PRC’s economic might and its rise to our region’s most powerful state require adjustments. The biggest risks in the coming decade will arise from possible mismanagement of this adjustment process by the Beijing government and the governments of other major states. I turn next to our determination to formulate a foreign policy independent of pressure on or coercion from other powers. We must prepare for tensions between the PRC and the US to continue; and possibly escalate. The United States has formally labelled the PRC a strategic competitor and wants to curb its ability to develop capabilities which the government in Washington views as detrimental to US interests. How these two nations manage their relationship is of great consequence to Australia. The United States is our ally of nearly seven decades. The People’s Republic of China will inextricably shape our future. Australia will not be forced into binary choices. Sometimes this will displease Beijing; at other times it will displease Washington. Some commentators and even government officials across the region and in the United States have started to speak of a new Cold War. This is not an accurate way to describe relations today between the PRC and the US. The Cold War was a confrontation between the US and the Soviet Union founded in ideology. China is a challenge to the United States and its allies not just because of its ideology. Its challenge is not just to the US politically, economically or even militarily. Instead China’s challenge to the United States is to America’s role as the leader of the international system and in East Asia. The PRC seeks to displace the United States as our region’s dominant power and revise the norms for governance in this region. China wants strategic influence, it wants to become economically and technologically superior, but it also wants international respect and freedom of action to attain its goals, and it wants others to accommodate its interests – all in areas where the United States has long enjoyed preeminent power and influence, and is not inclined to concede it. But the PRC is making this bid on the basis of reasonable great power aspirations. It does not seek to overthrow the international system. China has considerable resources. It is becoming more confident and more ready to compete globally but in many areas it also wants constructive and cooperative relations with the United States. A focus simply on the character of the political system in the PRC or on particular actions by the PRC government which we deem offensive or unfair can obscure this. We must remain masters of our own house. When I advocate a sensible and multi-dimensional approach to the PRC I do not wish to sweep aside our different values and our different world views. For example, Australia’s universities have a long and proud history of supporting free debate and enabling the robust exchange of viewpoints. Universities do not just provide students with knowledge. They prepare citizens to participate fully in political, social and economic life. We do not wish students to silently withdraw, or blindly condemn, when they are confronted with different value systems. Rather we want them to respectfully engage. The silencing of anyone in our society – from students to lecturers to politicians – is an affront to our values. Similarly, we object to covert arm-twisting of any individual in Australia by an official of any foreign government. We must be masters of our own house. We will confront foreign interference head-on. We do not accept the PRC government’s claim that Beijing should have authority over all people of Chinese heritage because they are bound to the Chinese nation by common blood, even those who are foreign citizens. Especially if this claim is used to infringe on the rights of the 1.2 million Australians of Chinese heritage. They have the same freedoms as all Australians – to live in a society governed by rule of law without fear of arbitrary pressure on the basis of their political views or religious beliefs, or their ethnicity or family connections. Chinese-Australians come from communities across Southeast Asia, Hong Kong, Taiwan and the PRC, and they have made a tremendous contribution to our multi-cultural society. They are enormously diverse in their political views and they view the PRC through multiple lenses. We will safeguard the rights of Chinese-Australians. We must not suspect every person who has connections in the PRC. Indeed, I would like to see more citizens of Australia and the PRC get to know one another. People from our two nations interact daily. We do business, conduct research, enjoy art, music, film and sport together, visit each other’s countries, and make friends with one another. We need to do more of this. People-to-people ties are the glue that binds our two countries together. In conclusion, I return to one of our most fundamental interests: We want to be at peace. This will require us to work closely with other countries to find a mutual understanding of the kind of regional environment we seek. It will require us to be independent-minded within our alliance relationship. Our alliance with the United States is a critical element of our security. But in this rapidly changing region in which the People’s Republic of China is intent on becoming the dominant power we must be nimble and constantly ready to grasp opportunities, meet challenges, and mitigate risks. We cannot automatically fall back on relying on our ally to support our interests. In this era of unpredictability our interests are not always going to align with the interests of the United States. I cannot emphasise enough the magnitude of the foreign policy challenge we face. Can it work? Can this China narrative form the basis of a policy to protect and advance the interests I outlined at the beginning? It will not be easy. Neither for the Government, nor for Australians. But I believe it can work, if we are clear in the way we go about it. First, everyone must keep in mind the many positives in our relationship with the PRC. Second, we in government must take you, the public, into our confidence. We fully accept that a foreign policy can only be successful if it has public understanding and support. I acknowledge that this means the security agencies must be as open as they possibly can about the concerns we have regarding the PRC without compromising national security. The Government will provide a factual report about the type of risks we have identified, so that you, the public, have the opportunity to properly debate the evidence. Despite our differences, and the challenges we have faced, Australia and China have built a constructive relationship over the last 47 years, and both countries have benefited immensely. The relationship today is comprehensive. But this time of enormous change demands that Australia have a new China narrative. To conclude let me summarise what is new in this narrative. This narrative is about engaging China, not merely managing our relationship. This narrative calls for deep and forward- looking engagement with the PRC. We cannot secure our national interests with a transactional approach to China. This narrative is about building a new kind of relationship between a middle power and a great power, with which we are already intertwined in multiple ways. This narrative is a realistic, candid assessment of ourselves and of the PRC. This narrative calls for Australia to speak out respectfully and firmly about what it finds unacceptable, regardless of the country. This narrative acknowledges that we cannot allow our relationship with the United States to compromise our determination to think and act independently vis-à-vis China. This narrative acknowledges that our capacity to influence is limited. Our interests have to be negotiated with clear eyes. But our values are non-negotiable. China Matters has mobilised a diverse group of Australian policy thinkers to formulate a ‘new’ China narrative for the incoming Australian government. The idea emerged following feedback from the China Matters Explores policy brief, ‘Is there a problem with Australia’s China narrative?‘ which China Matters CEO and Founding Director Linda Jakobson co-authored with China Matters board director, Professor Stephen FitzGerald. Rather than find fault and point out current failings, they felt it more prudent to explore what a new China narrative might look like. The next-to-final draft of ‘A new China narrative for Australia’ is the result of several brainstorming sessions, involving at least 30 Australian individuals from security, business, the university sector, and public service. Linda Jakobson is the principal contributor to the narrative, with other contributions from Stephen FitzGerald, Allan Gyngell, Jackson Kwok, Andrew Parker and Michael Wesley. China Matters is still continuing the consultative process and seeks to initiate a public debate on the contents of the Narrative. We request comments and suggestions be sent to [email protected] between 1 April and 30 April 2019. 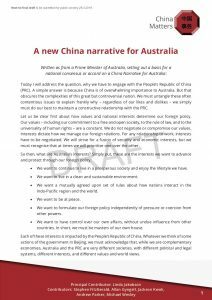 As of 1 May the contributors will review what was said at the launch of ‘Australia’s new China narrative’, as well as the suggestions sent by email. This next-to-final draft is the result of several brainstorming sessions, involving at least 30 Australian individuals from security, business, the university sector, and the public service. A final revision will take place in May before the narrative is presented to the new Government after the federal election.